Calderon told BBC Radio 5 Live: "I know that this morning the president [Florentino Perez] called Zidane to ask him back, he said not now. 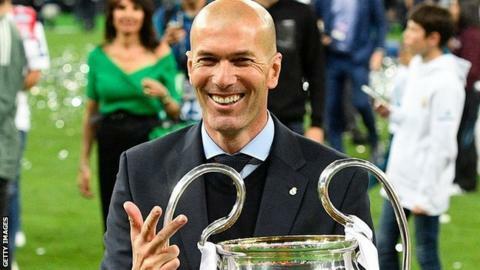 Zidane shocked Real by walking out just days after a famous win against Liverpool which made him the first manager to win three European Cups in a row and only the third to win three in total - along with Bob Paisley and Carlo Ancelotti. Real are expected to make sweeping changes after their season was effectively ended by a humiliating last-16 defeat by Ajax. Real replaced Zidane with Spain coach Julen Lopetegui - a move that was a disaster for club, coach and country - but he lasted just four months, with Santiago Solari eventually taking the reins. Now the club are expected to replace him with a third coach this season. Calderon says former Manchester United and Chelsea boss Jose Mourinho - who managed Real between 2010 and 2013 - is the favourite for the job, but such a move would be wrong. "The first option for the president has always, always been Mourinho," Calderon said. "It is an erratic and whimsical president who has brought us to this situation. "There is the option of bringing in Mourinho now, but to me there is no point. "At this moment of the season anything you do is going to be wrong, I suppose that they will wait until the end of the season but this is very long time, three months, to suffer all the critics and the anger of the fans."